June | 2014 | hello it's ming. The end of semester arrived after what felt like an endless three weeks of study and exams. Third year has definitely provided its challenges and pressure is most definitely mounting – as my Pharmacology lecturer expresses, “You guys are on the market next year”. So, between study, more study and planning for 2015 (it seems early but as usual application deadlines and New Years will arrive with little warning!! ), there has been little time for anything else! Completing my final paper on the painfully timetabled final Saturday morning of exam period, I met one of my oldest food ‘partners-in-crime’, M for brunch on this chilly Monday. Being my third visit to the increasingly famous Devon Cafe (Mama and I have have enjoyed both their brunch and lunch), I was eager to introduce M to this brunch haven. We agreed that after a hectic semester, the feeling of being able to simply “chill” over winter break (excuse the pun) was more than welcome in a widespread embrace! My insta-surveying had me eyeing the “Ultimate Toastie” special BUT to my the disappointment of my increasingly large winter appetite, I was told that this highly photographed dish is only served on Friday to Sunday! No matter, this momentary sadness was salvaged by the prospect of trying the “Eggs Blini”; Buckwheat blini, cured king salmon, salmon caviar, broccolini, sauce Mikado and poached eggs. Usually, ‘Benedict-type’ eggs are sometimes rather heavy, but thisdish was quite the opposite. 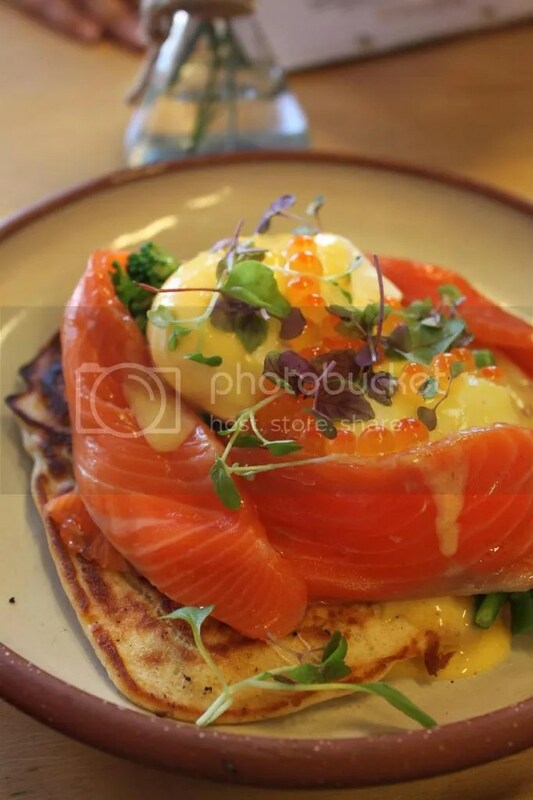 Eggs were poached to oozing perfection, blini was fluffy and slightly sweet and was complemented perfectly by a tangy sauce and delicious cured salmon. Never having seen this on a cafe menu before, I thought it was rather unique and definitely something I would recommend for poached egg enthusiasts and those looking for a dish that is not the ‘run-of-the-mill’ brunch option. This entry was posted in Bacon and Eggs, Banana, Breakfast, Brunch, Cafe, Chocolate, Coffee, Dessert, Eggs, French Toast, Friends, Fusion/Modern, Ice Cream, Pancakes, Peanut Butter, Restaurant, Seafood, Surry Hills, Sydney, Uncategorized, Winter and tagged banana, blini, blogger, Breakfast, brunch, caffeine, cappuccino, central, chill, coffee, cured salmon, delicious, Devon, Devon Cafe, DevonCafe, devonshire, eat, eggs, food, food blog, foodie, french toast, hello its ming, helloitsming, holiday, PB, PB&J, peanut butter, relax, semester, surry hills, sydney, university, winter on June 30, 2014 by helloitsming.